December 13, 2018, 6:00 p.m.
Americans believe that election results should put a limit on what legislators should be doing in any “lame duck” sessions – those sessions taking place after an election but before newly-elected officials are sworn in. 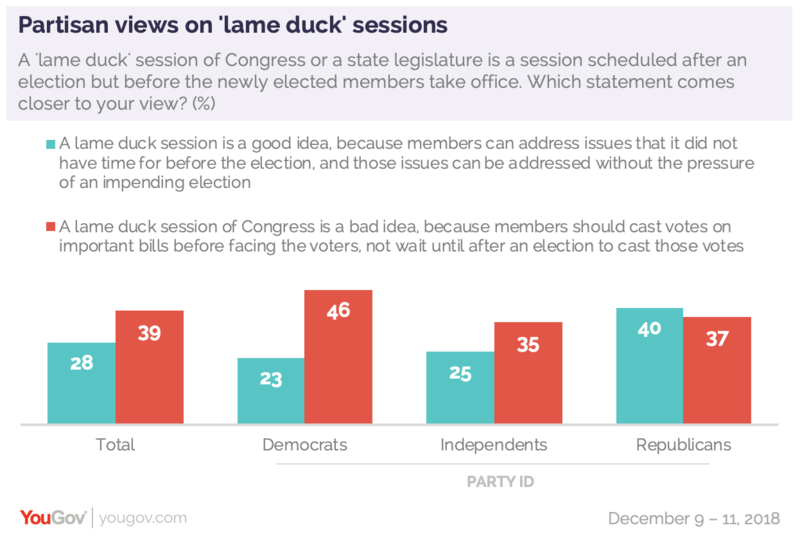 In the latest Economist/YouGov Poll, the public finds lame duck sessions a generally bad idea – and believes that legislators should be voting on important matters before an election, not afterwards. This has become a partisan question: Republicans, who lost Governor races in Michigan and Wisconsin, are currently attempting to limit the powers of new Democratic officials in those states (outgoing legislators in North Carolina attempted to do the same two years ago, but the courts ruled their actions in violation of that state’s Constitution). Congress currently is also in a lame duck session, with Republicans having lost their majority in the House of Representatives. There are many who see the value of lame duck sessions, as they can make up for bills legislators did not have time for before the election. Following given the outcome of this year’s Congressional election, those who see value are more likely to be Republicans than Democrats or independents. Still, a quarter of Democrats and independents say lame duck sessions are a good thing. Americans also oppose Congress and the President enacting major legislation after the election. Republicans approve of doing this. Those who have been paying attention to the controversy in Wisconsin are more likely to disapprove – but that’s partly because Democrats have been more attentive to this issue than Republicans have. Attentive Republicans are more likely than Republicans not paying attention to approve of lame duck passage of major legislation. 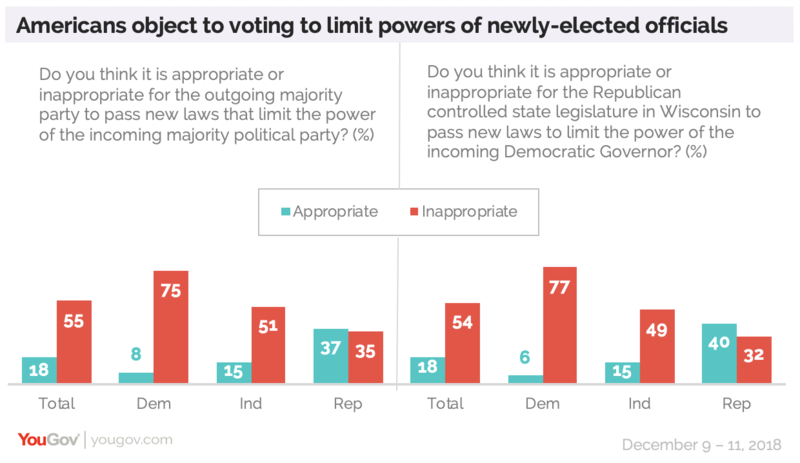 Americans are even more likely to object to lame duck sessions voting to limit powers of newly-elected officials. 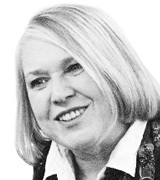 Partisan expressions are clear even when the specific parties involved are unmentioned. By three to one, the public says this behavior (both in principle and in the specific case of Wisconsin) is inappropriate. Republicans are closely divided on both, with small pluralities saying each behavior is acceptable. Conservative Republicans are especially supportive: by 42% to 28% they say what is going on in Wisconsin is appropriate. As the US Congress finishes its term, it is going out as a body that few think has accomplished much. Just 11% think it has done more than the usual Congress accomplishes, with nearly four times that number believing it has done less than usual. There has been a turnaround in how Republicans, whose party has controlled both Houses as well as the Presidency the past two years, look at their Congressional leaders. One year ago, Republicans approved of how Paul Ryan was handling his job as Speaker of the House, and disapproved of Senate Majority Leader Mitch McConnell. 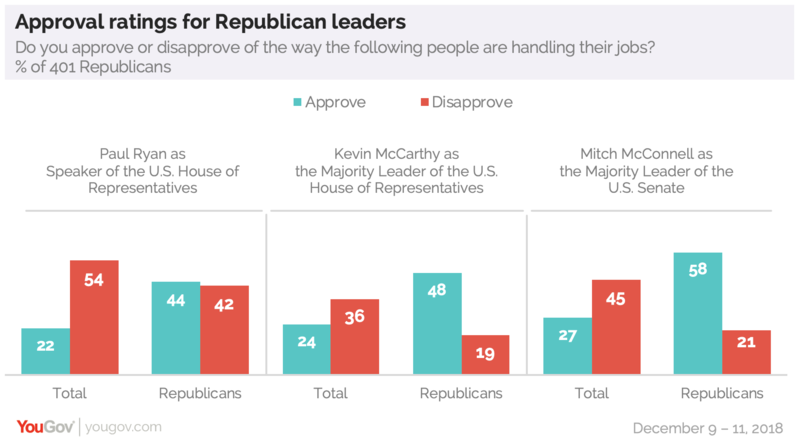 In this week’s poll, it is McConnell who gets Republican approval, while Republicans are just as likely to disapprove of the outgoing Speaker as to approve of how he is handling his job. GOP House Majority Leader Kevin McCarthy fares much better than Ryan among members of his party. 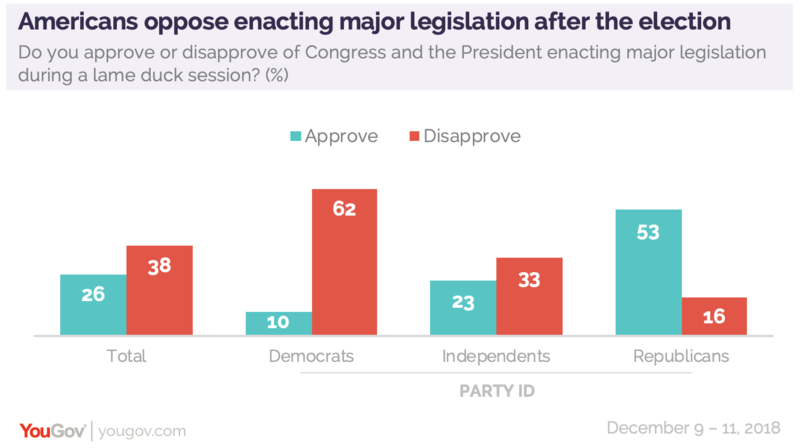 Majorities of Democrats approve of both their Congressional leaders, Senator Chuck Schumer and Democratic Minority Leader (and the party’s candidate for the new Speaker) Nancy Pelosi.